In the last ten to fifteen years a vast amount of research has been undertaken to improve on earlier methods for analysing the seismic reliability of structures. These efforts focused on identifying aspects of prominent relevance and disregarding the inessential ones, with the goal of producing methods that are both more efficient and easier to use in practice. Today this goal can be said to be substantially achieved. During these years scientific activity covered all of the many aspects involved in such a multi-disciplinary problem, ranging from seismology, to geotechnics, to structural analysis and economy, all of them to be consistently organised into a probabilistic framework. As the output of this research was dispersed into a multitude of technical papers, fib Commission 7 thought it worthwhile to select the essential aspects of this large body of knowledge and to present them into a coherent and accessible document for structural engineers. To this end a task group of specialists was formed, whose qualifications come from their personal involvement in the above-mentioned developments throughout this period of time. From its inception the group decided that the bulletin should have had a distinct educational character and provide a clear overview of the methods available. The outcome is a compact volume that starts by introducing the concepts and definitions of performance-based engineering, continues with two chapters on assessment and design, respectively, presenting the methods in detail accompanied by illustrative examples, and concludes with an appendix with sample programming excerpts for their implementation. 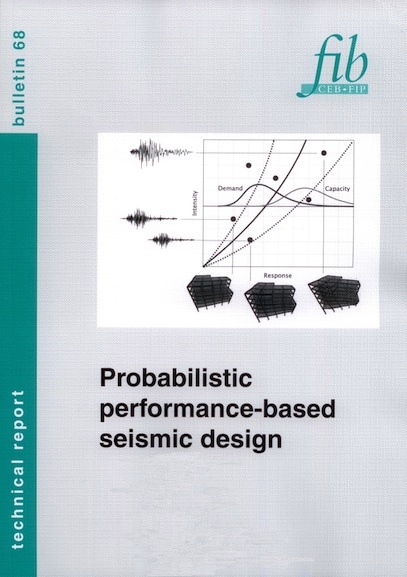 It is believed that at present fib Bulletin 68 represents a unique compendium on probabilistic performance-based seismic design.